Save the date and sign up today. 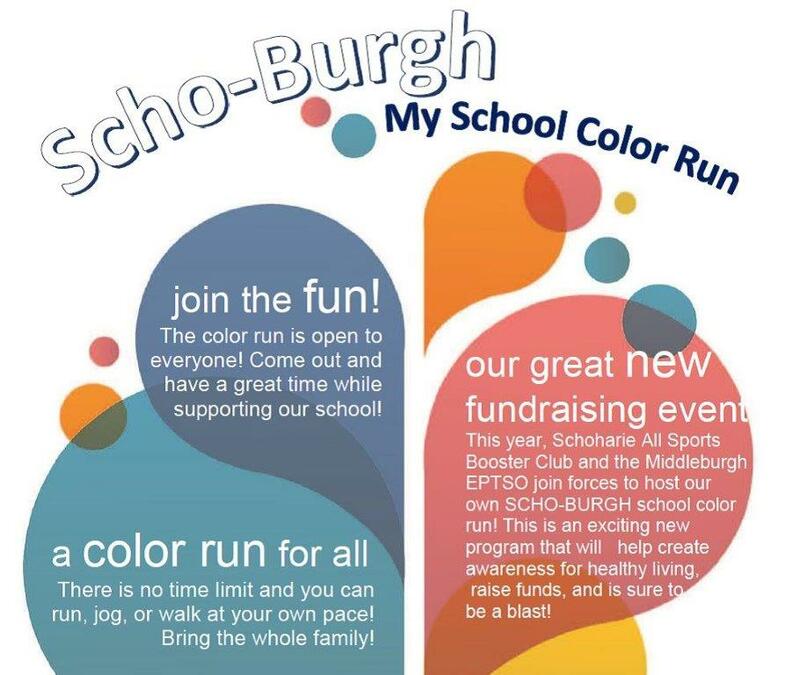 On April 30 at the Schoharie Central Schools campus, the SCS All Sports Booster Club and Middleburgh PTSO are holding the Scho-Burgh My School Color Run. Participants will walk, jog or run for 1 kilometer (.62 miles) or 5 kilometers (3.2 miles) at their own pace with no time limit, while being doused with safe, colored liquids. The color run is a fundraiser benefiting student activities at both school districts that also will raise awareness of healthy living in a fun way. Check-in is at 10 a.m. and the runs begin at 11 a.m., with a wave start every 15 minutes. All participants must be present at 11 a.m. Registration includes a packet, race bib and, for all who register before April 18, a My School Color Run T-shirt. Water and refreshments are also provided for participants. Until April 8, registration costs $20 for children and students in grades K-12 and $25 for adults. After April 8, registration costs $30 for children and students in grades K-12 and $35 for adults. Download the registration form here (PDF). Volunteers are sought to help with the race to help with water and refreshment stations, color stations and other tasks. Please sign up using the above registration form. Food and beverages for spectators will be available at a concession stand.